Descendants of a family that brought the first supermarkets and other businesses to the Hazleton area will gather next month for a family reunion. To date, more than 120 cousins from at least five branches of the Genetti family will attend the three-day affair at the ballroom of Genetti Catering in Hazle Township, according to family historian Louise Genetti Roach. “With hundreds of cousins throughout the United States, Italy and other countries, we hope to have attendees that represent every branch of our extensive family tree,” said Roach, of Santa Fe, New Mexico. She and others researched the family’s impressive history and can document 18 generations of descendants beginning in the mid-1400s. Roach, who was born in Hazleton, is a great-granddaughter of Damiano Genetti, who settled in the Hazleton area in the 1880s. He hailed from the tiny village of Castelfondo, Tyrol, which is now part of Italy. Damiano was among the first of his family to settle in the Hazleton area. According to historical accounts, he arrived in New York in the 1880s, boarded a train to Hazleton and walked to Nuremberg. In later years, he would spend $28 on a horse and cart to begin a door-to-door butcher shop. It was an investment that signaled the start of a number of successful Genetti businesses. Like many immigrants to the area, Damiano initially found work in the anthracite coal mines. “His first job was at the Derringer mines of Coxe Brothers and Co., a leading mine operator in the Hazleton area,” according to a family history written by one of Damiano’s sons, the late Stanley Genetti. He eventually was hired by the Ario Pardee Coal Co. in Lattimer and sent for his two sisters in Tyrol to keep house for him. “At the time, the coal regions contained a large number of unmarried men who recently arrived from Europe. Seeing an opportunity to increase their income by supplying housing to these men, Damiano and his sisters opened a boarding house,” according to the account. Thanks to the success of the boarding house, Damiano sent to Castelfondo for his wife-to-be. He and Oliva Zambotti married in 1886, had their first child in 1887, and returned to Castelfondo so Damiano could complete his required military service. Damiano and Oliva’s family grew to nine children in Tyrol, but with little opportunity for work, Damiano returned to America in 1901. He likely stayed with his brother, Raffaele “Ralph” Genetti, who operated a tavern in Weston. Another sister, Angeline Maddalena Genetti Reda, had a dry goods store in nearby Sheppton that sold shoes, clothing and other items to miners, according to Roach’s research. Damiano also decided to go into business for himself, and invested in the horse and cart. “He was a door-to-door butcher selling meat, cheese and homemade Tyrolean sausage from the back of a horse-drawn wagon,” Stanley Genetti wrote in the family history. After nine months of business in Weston, Damiano moved to Hazleton. “The business prospered so well (in Hazleton) that he sent for my brother Leon in early 1904 to help him. The following year he sent for the remainder of his family. With the entire family to help him, Damiano continued to expand his business,” Stanley wrote. It was hard work. Damiano woke at 4 a.m. daily to make sausage and stock his cart. Deliveries began by 8 a.m., according to Stanley. Everyone pitched in. “During most of my youth I received no pay for working for my father. He believed in the old European idea that children should be willing to work for their food and lodging,” Stanley wrote. Eventually, Damiano began to pay his children $35 a month plus lodging. As the business grew, Damiano opened a small butcher shop at Chapel Street and Fulton Court in Hazleton. In 1915, Leon Genetti opened a branch market at 436 S. Poplar St. and another opened on South Pine Street. A store on Green Street in West Hazleton followed a few years later. Despite having permanent stores, the family continued to run the horse cart to nearby mining villages. In 1923, Damiano retired and his sons bought his business. He would eventually return to Castelfondo. His children sold the West Hazleton store in 1924 and built a new shop at Broad and Pine streets. The store was one of the first in the nation to have refrigerated showcases. “Although retired, father disapproved of our plans. He felt that we were building such a grand store that people would be afraid to shop in it. He believed that the customers would prefer to purchase their merchandise directly from the meat wagon,” Stanley wrote. Damiano was correct; Stanley said people were initially hesitant to buy from the refrigerated cases. Eventually, however, business increased to the point where the Genettis needed more space. The family purchased a group of stores from the First National Chain Co. in 1929 and eventually opened outlets in places like McAdoo, Beaver Meadows and Freeland. The Genettis also took over a restaurant in the Hotel Altamont in downtown Hazleton, purchased a farm in the Conyngham Valley to raise cows and hogs, and opened a mink farm in Sugarloaf Township. 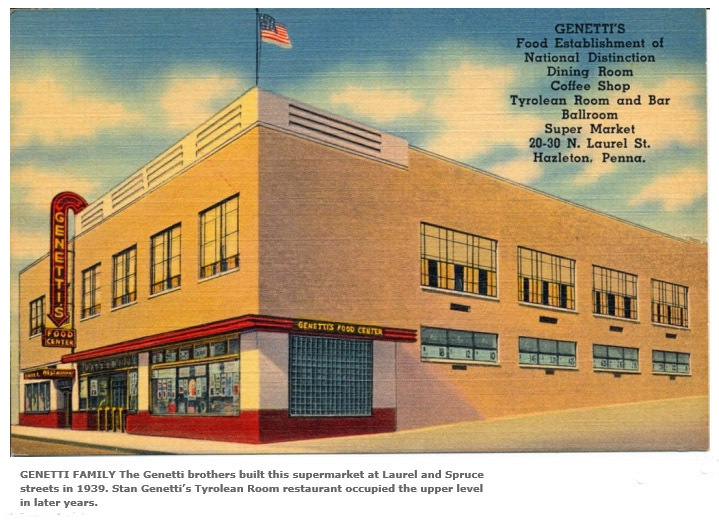 In 1939, the Genetti brothers built a supermarket at Laurel and Spruce streets. “It was equipped with the most modern air conditioning and refrigeration devices in the world. Of particular interest was our ‘magic eyes,’ which opened the main doors without a touch of the hand,” Stanley wrote in the history. 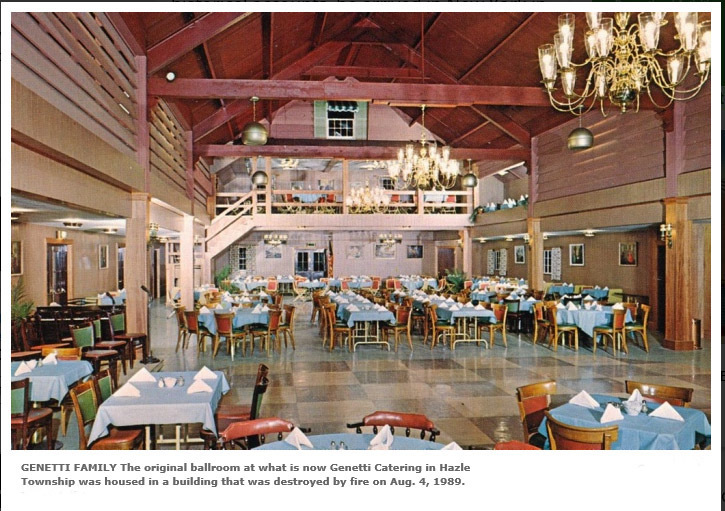 The site housed a popular restaurant, The Tyrolean Room, along with offices, a coffee shop and a banquet hall. But following World War II, the Genetti stores began to struggle against competitors. “To raise the necessary capital, we sold all our stores except those at Freeland, Broad and Pine streets and Laurel Street. Since each store was owned by one of the brothers, the corporation was practically dissolved for we each operated independently,” Stanley wrote. In 1954, Stanley decided to build his own store on 15th Street in Hazleton. To drive traffic to the store, he suggested establishing a bank branch there. “I experienced no difficulty in selling the idea to the Markle Banking and Trust Co. Thus, we became the first supermarket in the United States to house a bank,” Stanley wrote. The store also featured an underground conveyor that transported customers’ numbered grocery bags to a “loading shack” near the parking lot’s exit. An attendant would retrieve the groceries and place them in customers’ vehicles. The store also saw great success with S&H Green Stamps, a rewards program in which shoppers got stamps based on their grocery purchases which were redeemable for other items. Additional stores were opened in Lehighton, Lansford, Tamaqua, Wilkes-Barre, Edwardsville and McAdoo. In the 1960s, Stanley and his sons organized a new corporation, Pantry Quik Inc., and opened 11 convenience stores throughout Northeastern Pennsylvania. 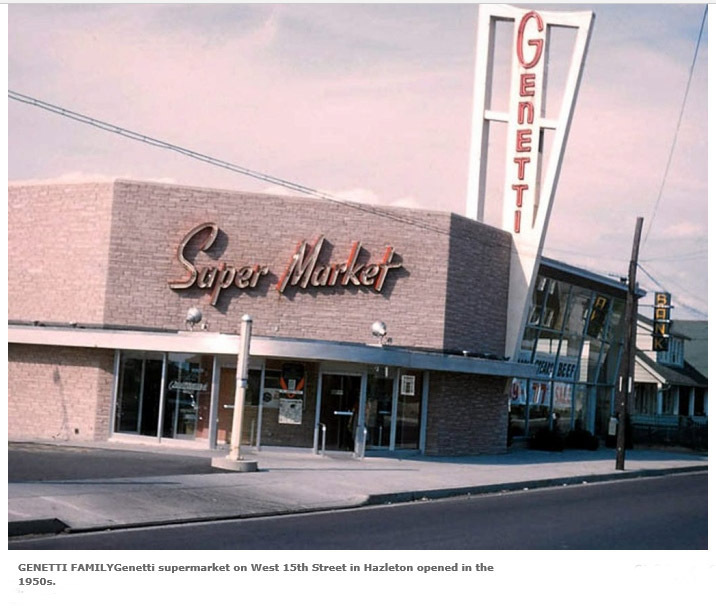 In 1967, the family opened a Genetti’s Supermarket in the Church Hill Mall. In 1969, the Genettis sold the supermarket business to Victory Markets of New York. The sale included the grocery stock, inventory and a 15-year lease on the real estate. Another brother, the late Gus Genetti, established “Gus Genetti’s Hotel and Restaurant of Distinction” in Hazleton in the 1940s. “The hotel business grew to include a hotel and conference center in Wilkes-Barre and an historic hotel in Williamsport. Gus’s two sons, Bill and Gus Jr., have owned and managed these businesses since the mid-1970s,” Roach said. The Hazleton hotel stayed with the Genetti family until 2015, when Bill Genetti sold it to Haridhan Inc. and retired. His son, Patrick Genetti, continues to manage the catering side of the business. Realizing the size of the family, Bill Genetti decided to start researching genealogy records on his grandfather, Damiano’s, side. He was able to find 186 descendents. By that point, the family had held a few get-togethers. When McNelis became too old to organize the gatherings, Bill Genetti took over and decided to include some of the cousins he had found. “Bill would do a dinner for Christmas from his hotel and catering business”, Roach said. In 1992, the event brought 120 people. Roach, a granddaughter of the late Leon Genetti and daughter of the late Joseph Genetti, began doing her own genealogical research about a decade ago. She grew up in Buffalo, New York, and while she remembered her grandfather’s Hazleton Heights store, she couldn’t recall any of her cousins. She created a Facebook page seeking relatives and within days dozens had contacted her. Using the information Bill Genetti had compiled, Roach was able to track down five branches of the family and has been in touch with Genettis from all over the country and from Italy. Invitations to the Oct. 7 to 9 reunion were sent to all, Roach said. It will be held from the ballroom of Genetti Catering and includes a reception, banquet and breakfast for family members. A special workshop, “The Basics of DNA” testing, will be held from 2 to 5 p.m. Oct. 8 at Genetti Catering and is open to the public. Reservations are required and the admission fee for non-family members is $10. For workshop reservation information, visit www.genettifamily.com/reunion-news.